I circled the town today. 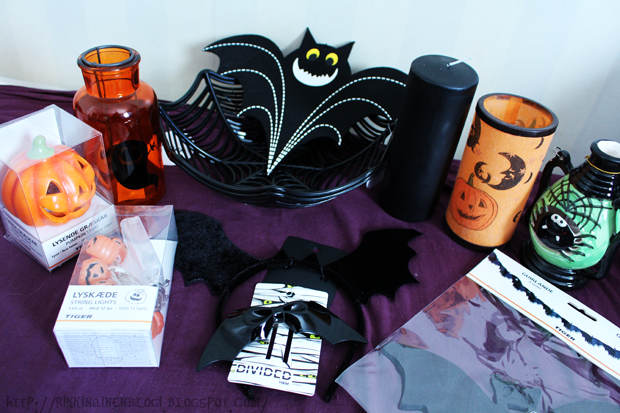 And found a nice catch of halloween goodies! I also checked Prisma and Tokmanni but there was NOTHING. Ah, well I got cute halloween napkins from Prisma but that's it. So cute ♥ ♥ ♥ ! Not long ago, I went to Germany and there is a shop that I love. He's called Tedi. And there were lots of cute stuff in the same type as in your photo. Besides, I think they have the same pumpkins garland. But, I have no money in my purse right now so I just content myself with a big bat to suspend :).